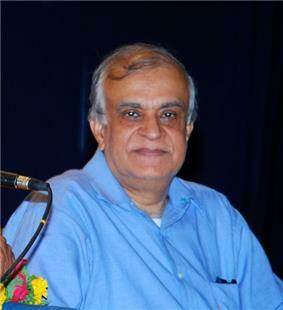 Rajiv Malhotra (born 15 September 1950), is an Indian-American entrepreneur who after a career in the computer and telecom industries took early retirement in 1995 to found The Infinity Foundation through which he has promoted philanthropic and educational activities in the area of Hinduism studies. Currently, Rajiv Malhotra is a full-time founder-director of the Infinity Foundation[web 3] in Princeton, NJ. He also serves as chairman of the board of Governors of the Center for Indic Studies at the University of Massachusetts, Dartmouth, and as adviser to various organisations. The Foundation has given more than 400 grants for research, education and community work. [web 1] The Infinity foundation has provided small grants to major universities in support of programs including visiting professorship in Indic studies at Harvard University, Yoga and Hindi classes at Rutgers University, the research and teaching of nondualistic philosophies at University of Hawaii, Global Renaissance Institute and a Center for Buddhist studies at Columbia University, a program in religion and science at University of California, and endowment for the Center for Advanced Study of India at University of Pennsylvania, lectures at the Center for Consciousness Studies at University of Arizona. The foundation has provided funding for journals like Education about Asia, International Journal of Hindu Studies and in the establishment of Mahatma Gandhi Center for Global Non-violence at James Madison University. According to Malhotra, a positive stance on India has been under-represented in American academia, due to programmes being staffed by Westerners, their "Indian – American Sepoys" and Indian Americans wanting to be white – whom he describes as "career opportunists" and "Uncle Toms" who in their desire to become even marginal members of the Western Grand Narrative sneer at Indian culture in the same manner as colonialists once did. Malhotra has accused the academia of abetting the "Talibanisation" of India, which would also lead to the Talibanisation of other Asian countries. An "integral unity" that gave rise to a dynamically oriented worldview based on the notion of Dharma. While the former is characterised by a top-down essentialism embracing everything a priori, the latter is a bottom-up approach acknowledging the dependent co-origination of alternative views of the human and the divine, the body and the mind, and the self and society. Once the transfer of knowledge complete, the former disciple, or/and his/her followers progressively erase all traces of the original source, repackages the ideas as their own thought, and may even proceed to denigrate the source tradition. ...the forefront of American Hindu effort to challenge the Eurocentricism in the academia. ... disregard for the usual canons of argument and scholarship, a postmodern power play in the guise of defense of tradition. Other scholars welcome his attempt to challenge the western assumptions in the study of India and South Asia[note 4] but also question his approach, finding it to be neglecting the differences within the various Indian traditions. In response, Malhotra points out that he does not state that all those traditions are essentially the same, that there is no effort to homogenise different Dharmic traditions, but that they share the assertion of integral unity. Malhotra, Rajiv (2007). "The axis of neo-colonialism". Indian Journals 11 (3). Malhotra, Rajiv (2009). "American Exceptionalism and the Myth of the Frontiers". In Rajani Kannepalli Kanth. The Challenge of Eurocentrism: Global Perspectives, Policy, and Prospects. Palgrave Macmillan. Malhotra, Rajiv , Aravindan Neelakandan (2011-A). Malhotra, Rajiv (2014). Indra's Net: Defending Hinduism's Philosophical Unity. HarperCollins India. ^ Malhotra disagrees with contemporary academic scholarship on Vivekananda, which shows how Vivekananda himself was influenced by western ideas, such as Universalism, via Unitarian missionaries who collaborated with the Brahmo Samaj. ^ Kurien 2007, p. 155: Quote: The next Indic studies organisation established in the United States was the Educational Council of Indic Traditions (ECIT), which was founded in 2000 (along with an associated Indictraditions Internet discussion group) under the auspices of the Infinity Foundation, based in New Jersey. The Infinity Foundation was formed in 1995 by the wealthy Indian American entrepreneur Rajiv Malhotra, who, after a career in the software, computer, and telecom industries had taken an early retirement to pursue philanthropic and educational activities. As Indic studies gradually became the main focus of the Infinity Foundation, the ECIT was disbanded (the Indictraditions group was also closed down later, in the summer of 2003). ^ a b Nussbaum 2009, p. 247: Quote: The chief antagonist behind these attacks is Rajiv Malhotra, a very wealthy man who lives in New Jersey and heads the Infinity Foundation, which has made grants in the area of Hinduism studies. ^ a b c d e f Kurien 2007, pp. 194. ^ a b c Nussbaum 2009, p. 246-247. ^ Kurien 2007, p. 202. ^ Hinnells 2010, p. 53. ^ a b c Bryant 2013, p. 453. Nussbaum, Martha C. (2009). The Clash Within: Democracy, Religious Violence, and India's Future. Harvard University Press. Tilak, Shrinivas (2012). "Differing Worldviews (Western and Dharmic) in Rajiv Malhotra's Being Different". Peter Wilberg (April 2008). Heidegger, Phenomenology and Indian Thought. New Gnosis Publications. ^ a b c d e "Rajiv Malhotra". The Huffington Post. TheHuffingtonPost.com, Inc. Retrieved 31 January 2012. ^ "Lessons from The Swami Nithyananda Saga". ^ "Problematizing God's Interventions in History". ^ "Dharma and the new Pope".